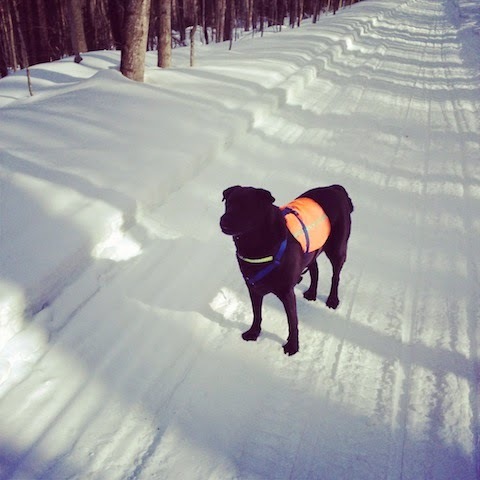 A long winter in VT! The new year started off pretty good with a bunch of rain and we got to go kayaking for a few days. Then winter fully kicked into gear with ridiculously cold weather and snow. 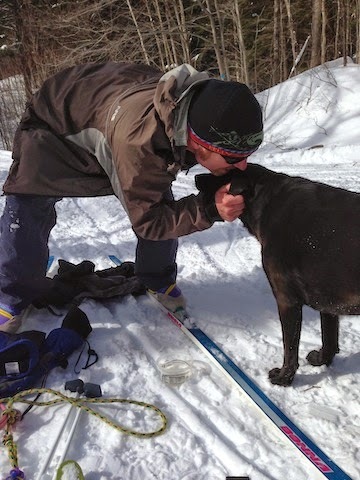 Jeff and I spent our time going to pool sessions, xc skiing, snowshoeing and snowboarding. I worked another season at Timber Creek Cross Country and Jeff worked his regular job and played music at a few different places in the area. As I mentioned before it was cold, I have never seen so much ice on the rivers and reservoirs here. 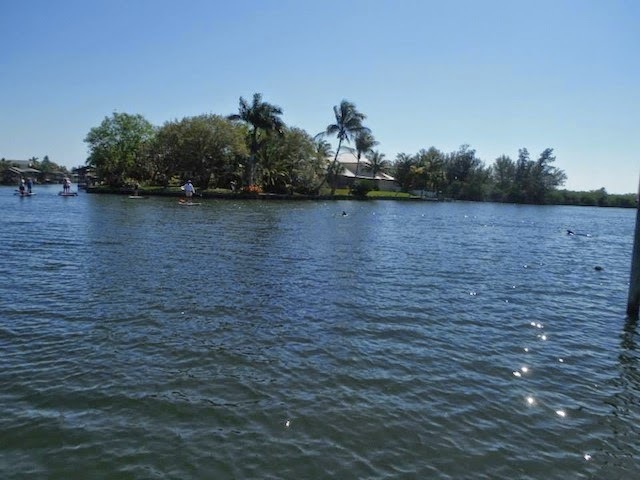 I usually can start flat water training in the Sherman Reservoir at the beginning of March. This year we still can’t really paddle in it yet because half of it is still iced up. 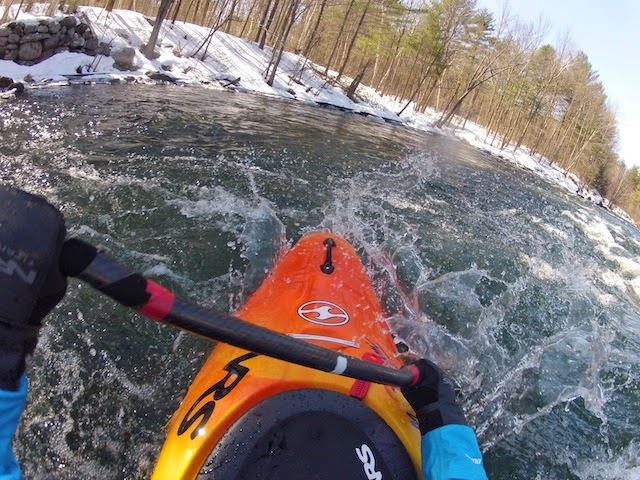 The take out of the Dryway on the Deerfield River is ice free so we started going this week in our wildwater boats to get some strokes in. When March rolls around I usually head to WV to start my paddling season but this year I decided to go some place warm so I went to Melbourne Beach, FL to hang out with my in-laws. I was bummed that Jeff couldn’t come because of work but I had a great time with Lynda and Doc. I played golf, walked on the beach, and went SUP’ing. I had such a great time that I’m going to go to FL in the middle of March and soak up the sun every year! After a couple days of golf it was time to SUP. I will say, I played the best 9 holes I’ve ever played and am looking forward to a few more rounds of golf this summer. Now, for my SUP adventure. 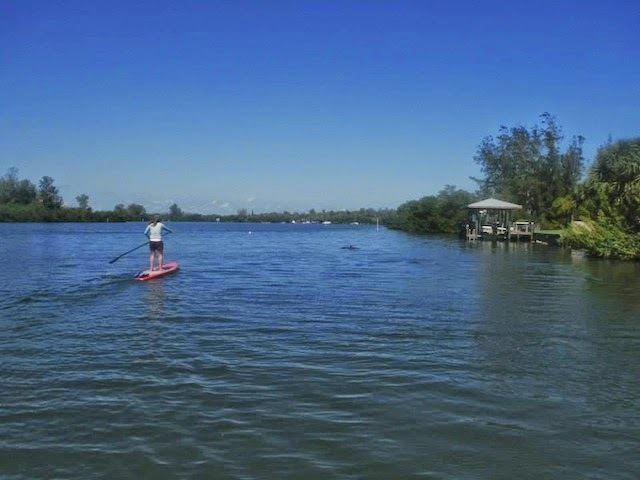 I had a great day SUP’ing on the Indian River. There was so many different channels to take and lot’s of wildlife to see. Luckily, I didn’t encounter any alligators while I was on my board! I did get to paddle with dolphins which was an amazing experience. I’ll tell you this, when I first saw a fin I almost lost my sh*t but then I realized it was a dolphin and then 3 appeared and one was a baby. They followed me under and around my SUP and I followed them, it was like a game we were playing. I rented my SUP from ECO Adventures and it was getting close to having to return it. I’m heading back to the beach area where we put-in and the dolphins are still swimming around me. I saw a motor boat up ahead and I heard a big splash and a lot of commotion. A yellow lab jumped off the boat because it saw the dolphins and the owner could not get the dog back on the boat. I started paddling over yelling to them that I’m coming to help. The dog at this point was freaking out swimming in circles. I sat on the board and the dog finally came over and I grabbed her by the neck and pulled her up on the board. She was shaking and a bit freaked out and she pretty much sat on me. I paddled over to the boat and they were able to pull her up on the boat. They were extremely thankful for the help and I told them that she should wear a life jacket so if she jumps off again it will be easy to get her back on the boat with the handle on the back. I was lucky enough to have witnesses and one was Lynda. Anyway, that was my adventure in FL. This past weekend I headed to NH to work the New England Paddle Sports Show for Confluence Water Sports. I went a day early to paddle the Winni River with Jeremy. I brought my brand new citrus Recon 70 with me to get it warmed up for the season. I’m so in love with my Recon 70! It paddles so well in all different classes of whitewater. The Winni is class II/III so nothing crazy on it, just good fun easy whitewater. It offers up all kinds of rocks to splat, little boofs, ferries and eddies to catch. It’s a great warm up run and runs a lot. The Recon 70 is a perfect boat to take down a run like the Winni, especially when it’s around 25 degrees and you don’t want a lot of face splashing. The shape of the bow sheds the water well and kept my face from getting icicles on it. I dressed warm with layers from NRS and wore my brand new NRS Crux drysuit which handled being fully covered in a sheet of ice great. I’ll have a review of the NRS Crux posted up soon. It just felt so good being back on the water! I headed over to the show and had a great weekend with the Confluence crew and getting people into boats. If you live in New England and are a paddler this show has great deals all weekend long. It was great catching up with Todd and Michelle from Pau Hana and Farley and Mike from NRS. I had a fun time at the event and am looking forward to next year. Jeff and I are finally back in our boats in flat water and hopefully soon the rivers around us will start to run. A bunch of the ice has broken up, we now just need some more rain and warmer temps for spring run off to begin. Competition season is upon us and there hasn’t been much time to practice because of ice, as Alan Iverson once said “I know it’s important, I honestly do but we’re talking about practice. We’re talking about practice man. We’re talking about practice. We’re talking about practice. We’re not talking about the game. We’re talking about practice.” Ohhhhhhh, thank you AI for that quote, it’s by far the best pro sports quote ever! Jeff and Brook taking a break from xc skiing. 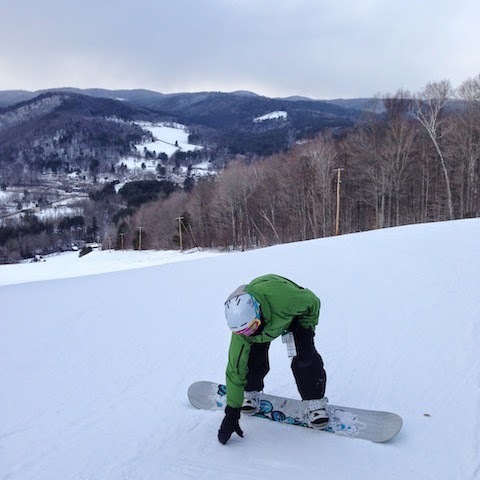 Snowboarding at Berkshire East with my Shred Ready Eleven helmet on. 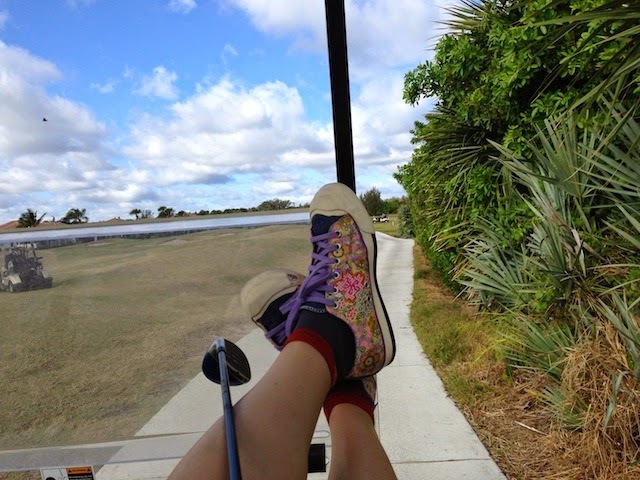 A great day of golf wearing my KEENs. 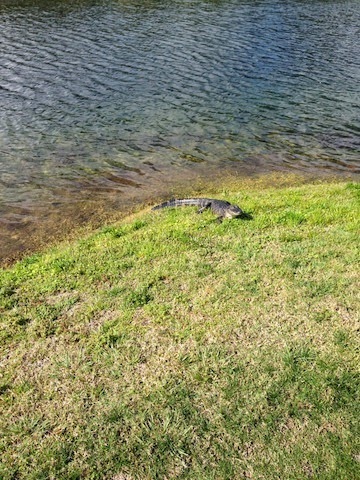 An alligator getting a tan on the 4th hole. Back to winter! 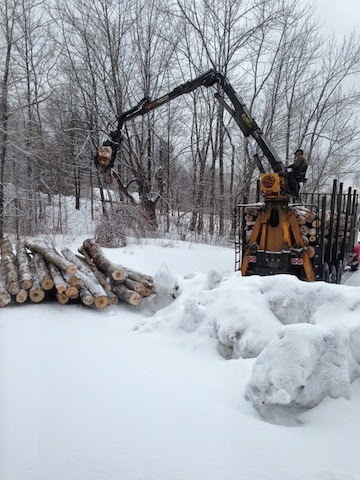 Our wood pile for next year. 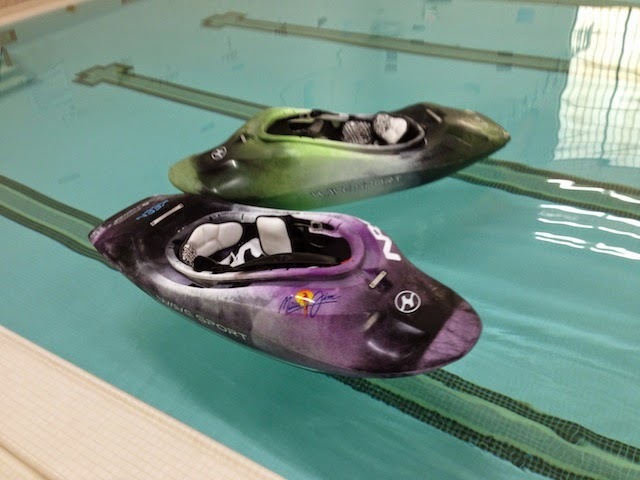 The Wave Sport Mobius 49 and 57 getting some pool action. A cold day on the Winni River in my Recon 70. Jeremy and I frozen solid.